he Palm cradle looks pretty slick and comes with a switching regulator power supply. It is however not an ideal lithium battery charger. See below. This article examines how Palm intended to charge the Palm Vx internal lithium cells. The cradle was put to test in the following circuit. 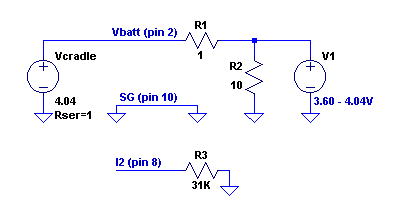 The test circuit uses a variable power supply (V1) with a shunt resistor (R2). This way the cell voltage can be more easily simulated and measured nicely in 0.05V increments. Series resistor R1 is used to measure the load current. It is made 1 ohm because I think the Palm lithium cell also has roughly the same internal resistance. This is based on a small cell voltage drop (3.85V to 3.83V according to the palm) when removing a small load current (25mA). R3 has been added to make sure the cradle detects the connected circuit. The styus holder light will lite. As for the measurement results, it hardly made a difference whether this was connected or not. 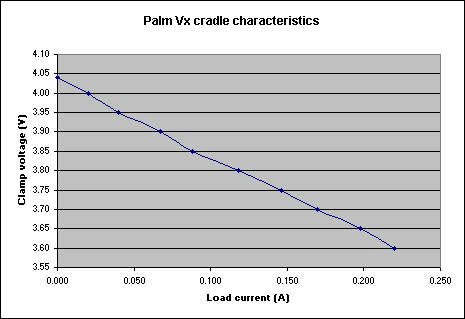 The measurements show clearly that the cradle is not a constant current charger. It actually looks like a 4.04V voltage source with an internal resistance of 1 ohm. From the image can be derived there is a 2 ohm series resistance, but that includes the 1 ohm in our test load circuit. The charger seems to deliver a hefty 150mA at the Palm battery-low warning level of 3.75V. I have no knowledge of the actual capacity and optimal charge current of the Palm lithium cell yet, but this could be on the high side of what is considered healthy. Probably it is better for the lifetime your cells to recharge them regularly when not really empty, then to wait until you get a warning. Remember that lihium cells do not suffer from a memory effect as NiCad cells do. As the cells become more full, the charge current reduces. This is the reason why it takes much longer to get from 70% to 100% charge then it is from 40% to 70%.